For the Apple file sharing protocol, see AirDrop. 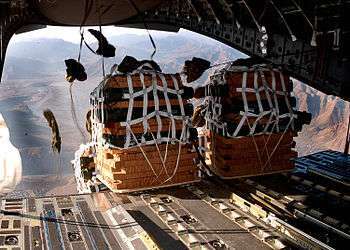 A C-17 military transport airplane drops humanitarian aid load, dealing with the aftermath of the 2010 Haiti earthquake. An airdrop is a type of airlift, developed during World War II to resupply otherwise inaccessible troops, who themselves may have been airborne forces. In some cases, it is used to refer to the airborne assault itself. Early airdrops were conducted by dropping or pushing padded bundles from aircraft. Later small crates with parachutes were pushed out of the aircraft's side cargo doors. Later cargo aircraft were designed with rear access ramps, lowerable in flight, that allowed large platforms to be rolled out the back. As aircraft grew larger, the U.S. Air Force and Army developed low-level extraction, allowing tanks and other large supplies to be delivered, such as the M551 Sheridan or M2 Bradley. Propaganda leaflets are also a common item to airdrop. The airdropping of weapons evolved to the concept of having the payload itself as one massive bomb. The 15,000 pound (6,800 kg) BLU-82, nicknamed the "Daisy Cutter" for its ability to turn a dense forest into a helicopter landing zone in a single blast, was used in Vietnam and recently in Afghanistan. The 22,600 pound (10,250 kg) GBU-43/B, nicknamed the "Mother Of All Bombs", was deployed to the Persian Gulf for The Iraq War. These palletized airdropped weapons are used by cargo aircraft like the C-130 or C-17 in the traditional role of a bomber aircraft. In peacekeeping operations or humanitarian aid situations, food and medical supplies are often airdropped from United Nations and other aircraft. The type of airdrop refers to the way that the airdrop load descends to the ground. There are three main types of airdrop, and each type may be performed via several methods. 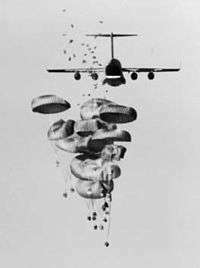 Low-Velocity Airdrop is the delivery of a load involving parachutes that are designed to slow down the load as much as possible to ensure it impacts the ground with minimal force. This type of airdrop is used for delicate equipment and larger items such as vehicles. High-Velocity Airdrop is the delivery of a load involving a parachute meant to stabilize its fall. The parachute will slow the load to some degree but not to the extent of a Low-Velocity airdrop as High-Velocity airdrops are used for durable items like MREs. LAPES (Low Altitude Parachute Extraction System) is a variation of an HV drop where the aircraft almost completes a touch-and-go type pattern (without actually touching the ground) and the load is ejected at an extremely low altitude. This is shown in the photo of the C-130 airdropping a tank. Free Fall Airdrop is an airdrop with no parachute at all. A common example of this type of airdrop is the delivery of leaflets used in psychological warfare. A humanitarian aid supply drop. The method of airdrop refers to the way the load leaves the aircraft. There are three main methods of airdrop currently used in military operations. Auto Extraction airdrops use an extraction parachute to pull the load out of the aircraft end of the airplane. In this method, an extraction parachute is deployed behind the aircraft which pulls the load out and cargo parachutes are deployed to slow the load. Extraction drops are usually Low-Velocity airdrops, with rare exceptions (e.g. Low Altitude Parachute Extraction System). Manual Extraction airdrops, where the load is physically pushed out by a specially trained crew of up to four people. Gravity airdrops use gravity in the sense that the attitude of the aircraft at the time of the drop causes the load to roll out of the plane like a sled down a hill. The most common use of a gravity airdrop is for the Container Delivery System (CDS) bundle. Door bundle drops are the simplest of airdrop methods. In a door bundle airdrop, the Loadmaster simply pushes out the load at the appropriate time. Historically, bomber aircraft were sometimes used to drop supplies, using special supply canisters that were compatible with the aircraft's bomb attachment system. 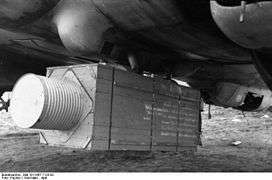 During World War II, German bomber aircraft dropped containers called Versorgungsbomben (provisions bombs) to supply friendly troops on the ground. The British equivalent was the CLE Canister that could carry up to 600 pounds (270 kg) of supplies or weapons. Notably, British and American bombers air-dropped weapons to the Polish Home Army during the Warsaw Uprising in 1944. The Western Allies also used bombers to drop food on the Netherlands to help feed civilians who were in danger of starvation in the Dutch famine of 1944. The Anglo-American Operations Manna and Chowhound took place with Germany's agreement not to fire on the aircraft taking part. Gravity airdrop of CDS bundles from a C-17. Extraction airdropping a light tank. Airdropped humanitarian supplies being recovered in Haiti, (2010). Technical Order (TO)13C7-1-11 Airdrop of Supplies and Equipment: Rigging Containers. Department Of The Air Force. September 2005. Technical Order (TO)13C7-1-5 Airdrop of Supplies and Equipment: Rigging Airdrop Platforms. Department Of The Air Force. August 2001. 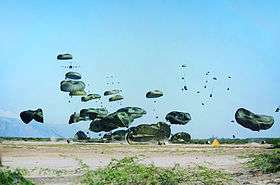 Wikimedia Commons has media related to Air drops. 47 Air Despatch Sqn RLC The British Army's only remaining unit specialising in airdrop. Airdrop of Supplies and Equipment: Rigging Loads for Special Operations Headquarters, Department of the Army, United States Marine Corps, Department of the Navy, Department of the Air Force.